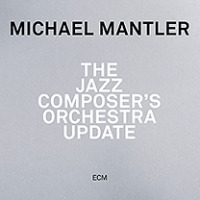 Review: "Mantler, Michael: The Jazz Composer's Orchestra Update" - Sea of Tranquility - The Web Destination for Progressive Music! Recorded live at Porgy & Bess in Vienna, Austria in September of 2013, The Jazz Composer's Orchestra Update is a stunning set of music from legendary composer-trumpeter Michael Mantler and the Nouvelle Cuisine Big Band, conducted by Christoph Cech. It's actually a re-imagining of Mantler's classic 1968 recording The Jazz Composer's Orchestra for the JCOA label, and here with new musicians these pieces are taking on new life and being released through ECM Records. If you haven't heard the original, no need to worry, as this new re-imagining is guaranteed to knock your socks off. Mantler seems to love the mixing of big-band jazz, symphonic classical orchestrations, and progressive rock, which gives these arrangements big, bold, and dramatic flourishes that keeps the listener on their toes at all times. The leaders commanding trumpet solos pop up from time to time, but it's guitarist Bjarne Roupe who really impresses in solo spots, as his daring rock fueled explorations bring to mind Robert Fripp or John McLaughlin, savagely darting between huge orchestral swells on "Update Eleven" like a venomous snake. Old school jazz nuts will love the soaring "Update Ten" and the tricky "Update One" (featuring a stunning Mantler solo), but it's the 3-part suite "Update Twelve" that provides for the albums most dramatic moments, as Roupe's sinewy leads (sounding like a young Mike Stern!) battle horns, reeds, and drums for some truly memorable passages. This is great stuff, a classy recording featuring some outstanding musicianship and composition. If you get to listen to just one big band jazz album this year, make sure this is the one. Another winner from the folks at ECM Records.